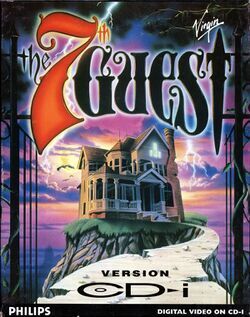 The 7th Guest, first published in 1992 by Trilobyte and later released by Virgin Games in 1993, is an FMV-based puzzle video game, not unlike The Fool's Errand and predating Myst. It was one of the first computer video games to be released only on CD-ROM. The 7th Guest is a horror story told from the unfolding perspective of the player, as an amnesiac. The game received a great amount of press attention for making live action video clips a core part of its gameplay, for its unprecedentedly large amount of pre-rendered 3D graphics, and for its adult content. In addition, the game was very successful, with over two million copies sold, and is widely regarded as a killer app that accelerated the sales of CD-ROM drives. On December 15, 2010, The 7th guest was re-released for IOS devices. It uses the same controls as the PC version, using the screen in the place of a mouse. Three Puzzles were left out of the game as they were too complicated to be added. The puzzles that were taken out of the game were "The Pentagon / Knife Puzzle", "The Piano Puzzle" and "The Microscope Puzzle". The story revolves around a man named Henry Stauf. Stauf was a simple drifter and thief. One night, he murdered a woman on her way home from choir practice, so he could steal her purse. As he was sleeping that night, he dreamt of a doll so beautiful that he had to make it for himself. He did so, working without rest, until it was indistinguishable from the one in his dream. Afterwards, he went to a bar in town. The owner saw the doll and said his daughter would love it, and Stauf offered it to him. In return, the owner offered Stauf food and a place to stay. Stauf continued to have dreams, and continued to build the toys just as he saw them, selling them for profit. Due to high demand, Stauf opened a toy shop. As Stauf's toymaking empire reached its zenith, a mysterious virus started killing the children. Doctors did all they could, but nothing could be done to save them. Meanwhile, Stauf, acting upon one last vision, built for himself a large mansion using the wealth his toys had brought him; "a strange house, a house that scared people." He wasn't heard from again for quite some time, until one day, invitations were sent out to six individuals inviting them to stay at the Stauf mansion for the night. Upon their arrival, however, Stauf was nowhere to be found – only a collection of his puzzles scattered around the house and notes to each of the guests informing them that they were there to play a game could be found. The winner of the game will be rewarded with his most secret desire, but they are left to discover for themselves exactly what the rules and objective of the game are.